Bring a mini Japanese garden into your home—whether as a stress-reducing desk accessory, interesting centerpiece or beautiful addition to any space!Bring the tranquility of Japanese garden design into any space in your home or office. Miniature Japanese Gardens shows you how to create simple Japanese-style container gardens using inexpensive plants and materials that are available everywhere!A detailed plan of each "garden" provides a basic template, along with information about plant types and containers. The container itself can be an old pot, ceramic bowl, or just about anything you might have lying around. Such "found" objects lend themselves to the Japanese art of wabi-sabi—the beauty of imperfection. 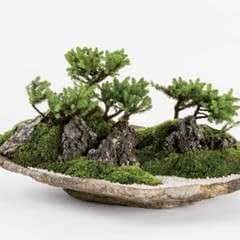 Add rocks and other elements to produce mini Zen gardens that bring a relaxing vibe to any interior space.Miniature Japanese Gardens contains step-by-step instructions and photos of over 40 different projects, including: Kokedama (moss ball) A miniature bamboo groveA variety of bonsai treesAnd many more! Plus, get inspired by accompanying photos of the Japanese landscape. While you may not be able to have a waterfall in your house, you can channel the same sensation with the help of just the right bonsai plants from this book. 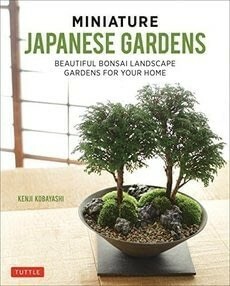 Miniature Japanese Gardens will appeal to gardeners, Zen students and small space enthusiasts alike!